Choosing the right parts washer for your bike workshop. Bike workshops and servicing centres need to get bikes cleaned quickly and efficiently. The intricate parts of the bikes mechanism can quickly become contaminated with dirt, grease, soils, dust etc., which need to be removed to avoid lasting damage to the bike. Our solvent free parts washers have been designed to be tough on dirt; our aqueous parts washers provide exceptional cleaning performance without the use of harsh chemicals – ideal for your bike workshop. 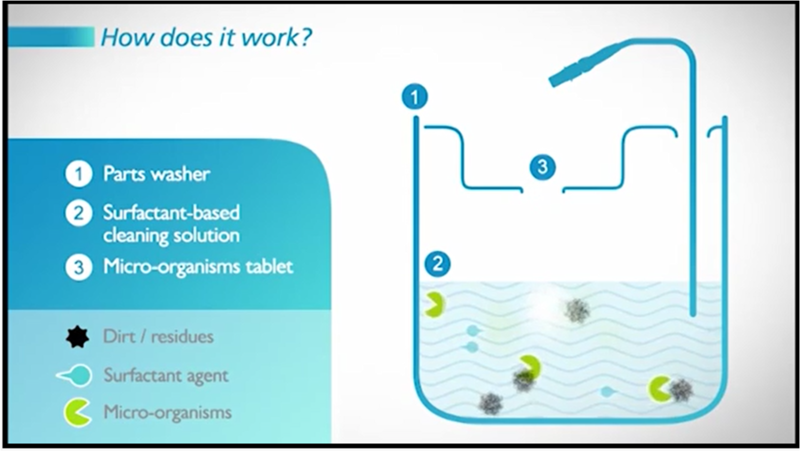 Using a bioremediating parts washer system means there are no harsh chemicals which can irritate users skin and cause damage to the environment. 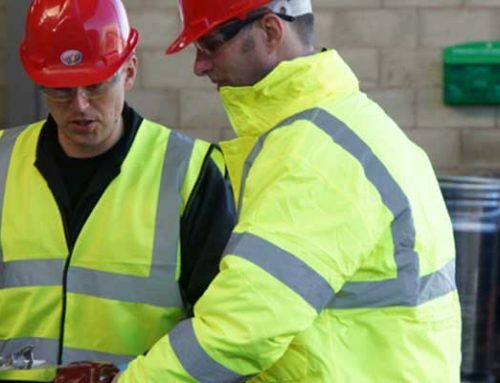 It also means there’s no hazardous waste to get rid of or flammable solution to deal with. How does an aqueous parts washer work? The parts washer is filled with a surfactant based cleaning solution that is heated to provide optimal cleaning performance. When the contaminants are washed into the machine, the micro-organisms neutralise these substances. 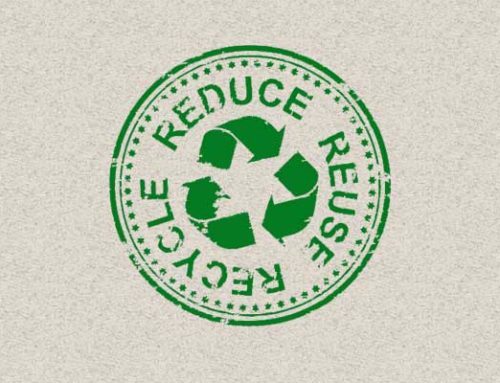 This means the solution in the system is ‘cleaned’ and recycled, so there’s no hazardous or contaminated solution to dispose of. The RED BioTabs ‘top up’ the system with micro-organisms to keep it working at maximum cleaning efficiency. 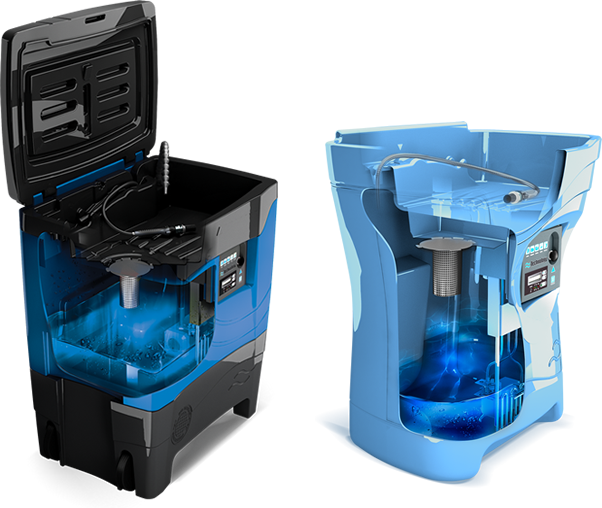 By using a bioremediating parts washer system, the solution is continually refreshed and does not lose it’s cleaning performance over time. Typical sink-on-drum and other solvent based cleaning solutions, lose their effectiveness as the solution becomes contaminated and has to be drained, disposed of, and new solution put into the system. Choosing an aqueous parts washer is the more environmentally friendly choice and can also provide cost savings to your bike workshop. Our aqueous parts washers effectively clean and degrease. Take a look at our short video which shows the cleaning power of our parts washers. Using a parts washer in your bike workshop will allow you to easily clean the hard to reach places using the flexible hose. 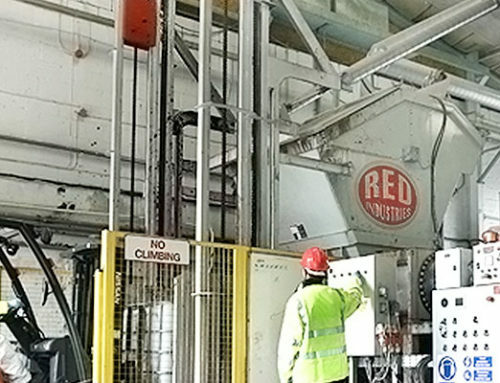 The RED BL+ water based cleaning solution with added surfactants is heated to 38°C to offer good cleaning performance as well as being pleasant for the operator to use. The temperature boost function can be used to increase the solution to 43°C to help to remove even stubborn dirt and grease. We have two manual parts washers, both of which are suitable for use in bike workshops. Contact us to find the right machine for your workshop, service or repair centre. 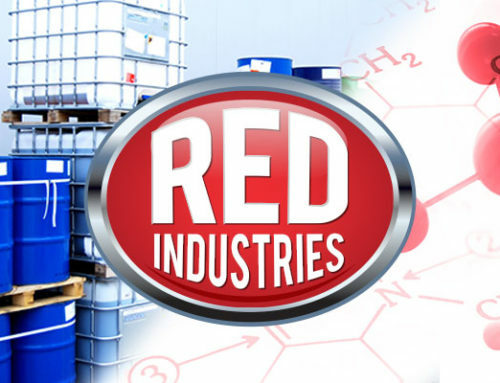 Bothe the REDM100 and REDM60 use the process of bioremediation to efficiently and economically clean gears, sprockets, mechs, frames etc. 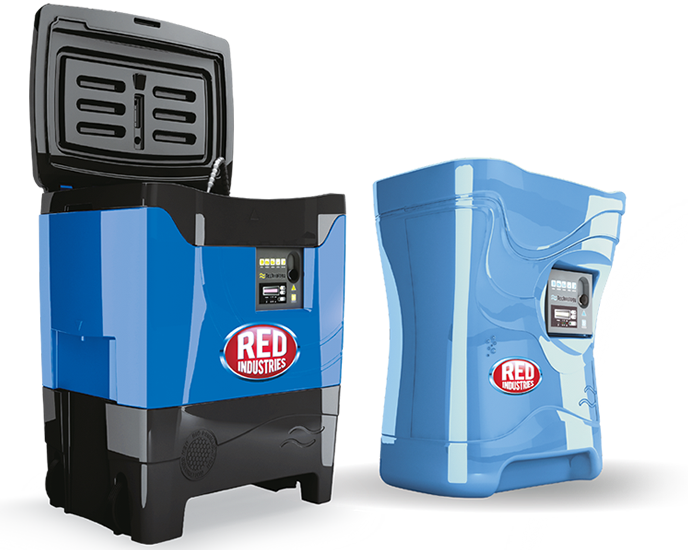 The REDM100 has a lid to limit any evaporation. You can increase productivity and minimise the amount of time spend cleaning as it has a large 30L soaking area and overflow system. The REDM100 is also fitted with wheels, making it easy to manoeuvre around the workshop. The flexible hose and interchangeable brush and tools allows you to clean the hard to reach places. The REDM60 also comes with a flexible hose. It can also be fitted with an additional bike stand attachment to allow you to easily clean and repair, with no need for additional equipment. Both parts washers have been ergonomically designed and incorporate a simple to use control box. 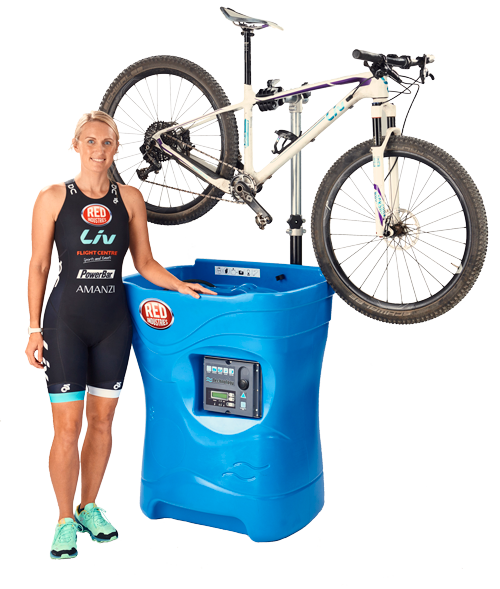 Our REDM60 parts washer can be supplied with a bike stand attachment, making it ideal for use in cycle workshops as the bike can be cleaned and serviced whilst on the bike work stand. The bike stand height can be adjusted from 1m-1.6m and has 360°C rotation. With this parts washer, there’s no need for dismantling or ‘propping up’ the bike whilst you clean. Our REDM60 is pictured below with international triathelete, Jacqui Slack. Tough on grease, easy on the environment! 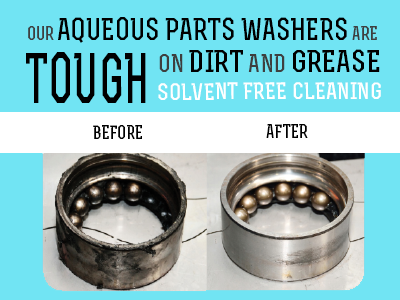 If you’d like to see how the aqueous parts washers can benefit your bike workshop, talk to us about our free trial offer. 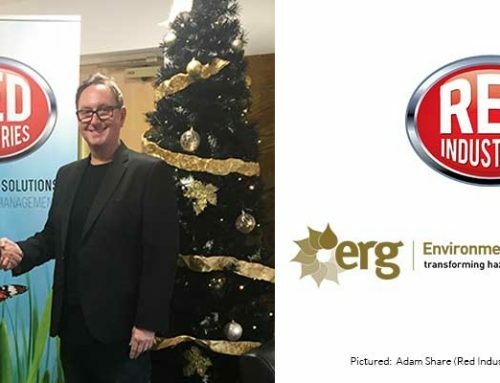 There are no hidden extras or surprise rolling contracts – we build a relationship with our customers and are open about our service contracts. See our full range of parts washers.